J!MailAlerts is great for Intranets, Social Networks, News Portals & for any kind of site that regularly generates content. It is completely extensible using plugins which means you can virtually add an update about activities in any extension on your Joomla website. 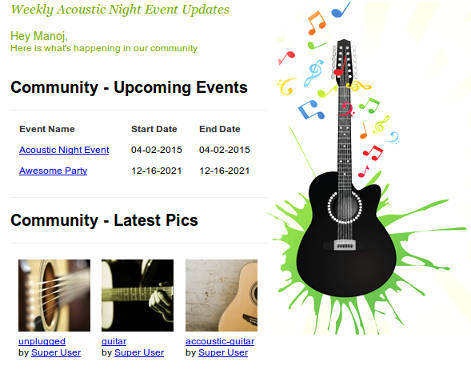 Its a great way to keep your users in touch with whats going on your website & keep them coming back. Get J!MailAlerts today & Engage your community! J!mailAlerts gives you a completely automated system to send regular email updates to your users without touching a button. Just set it up, set the cron job & forget about it! Subscribing can be automated or self service for your users. Alert types are individual 'Automated Newsletters' that users can subscribe to. As an admin, you can choose to create any number of alert types & assign specific content plugins to them. Alert types can be set to be configurable by users or Admin controlled & each type has its own extensive configuration including Email Design, frequency, batch size etc. 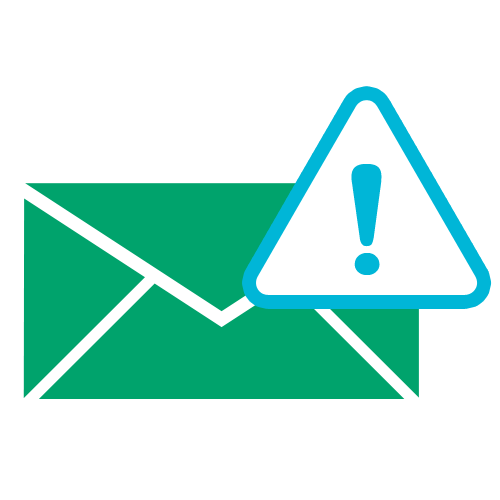 J!MailAlerts comes with a flexible Email Designer in the backend for each alert type. You can design your HTML & CSS using the same. J!MailAlerts uses Emogrifier a library built to make sure that the emails look good in most email clients. You can also control the design output of each content plugin by overriding its template files in your template! You can use standard frequencies like Daily, Monthly, Weekly etc or create your own frequencies for alerts with frequency least count being a minute. As an admin you can use the registration plugin to auto subscribe users to default alert types at registration. 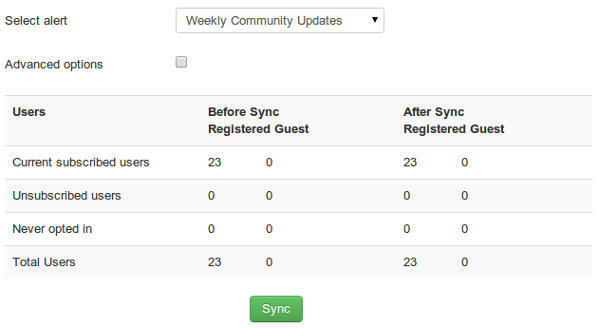 If you are installing J!MailAlerts on an active site that already has users & you wish to subscribe them, you can use our Sync feature. J!mailAlerts lets you simulate emails to actual users & control the various simulation parameters in order to accurately check how an outgoing email will look & what content it will contain. Email Content plugins are extensively configurable in order to give more control to admins & users. However since you cannot create copies of plugins & use them in different ways for different alert types, we have come up with Data tags that allow you to configure each plugin on an alert type level. 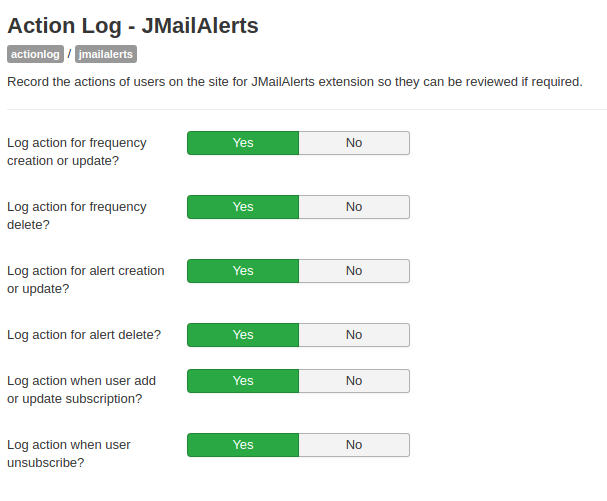 Actionlog plugin for JMailAlerts logs actions for activities related to frequency, alerts and user related activities like unsubscribe, add/update subscription. The privacy plugin is responsible for processing privacy related requests to JMailAlerts. Privacy related requests are related to export and deletion of user data. Users can have a very high level of control on which alerts to subscribe to with what frequency. In addition, each plugin in the alert can be configured as well. For instance, a user may choose to subscribe to the 'News Alert' which uses Joomla content only for the 'Cricket News' category & subscribe to the 'Blog & Discussions Alert' & choose to receive updates on Discussions about Sports (Kunena) & blogs (EasyBlog) about films. 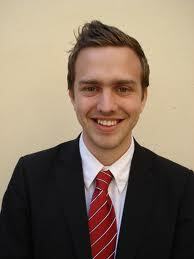 Why should registered users have all the fun? 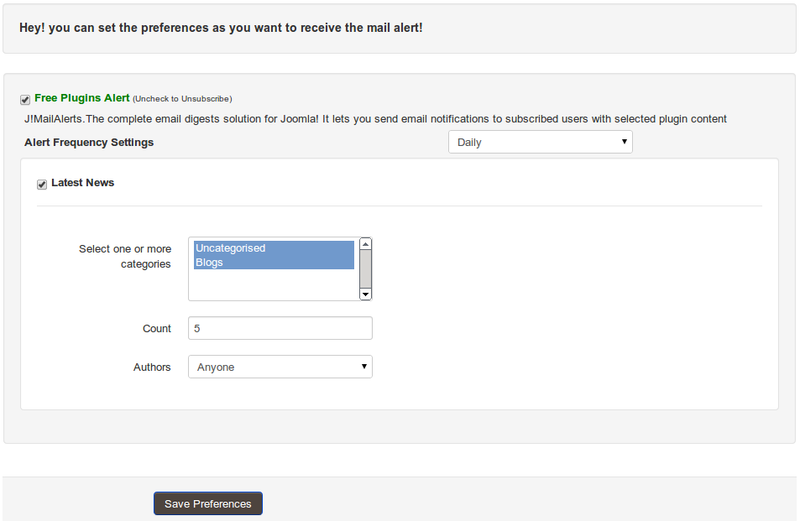 J!MailAlerts allows your users to easily subscribe to updates on your site without having to register! J!MailAlerts supports SocialAds's 'Ads In Emails' function. With this, you can automatically insert relevant targeted Advertising in your email alerts & earn much more by expanding the target audience. Use J!MailAlert Plugins In Other Extension Emails To Enrich Them! Admins can easily use any of the J!MailAlert plugins with other components like Email Beautifier and Invitex to enrich the email content &make their emails more relevant & get more attention to site content by spreading the reach. Content of the alerts is completely plugin driven & hence extensible to virtually any Joomla extension ! Techjoomla itself offers over 25 free & paid plugins for a variety of Joomla extensions including CB, JomSocial, EasySocial, Joomla content, K2, Phoca to name a few. Besides these, there are several Third-Party plugins available for J!MailAlerts. If you are a developer, browse our developer docs to see how to develop your own. J!MailAlerts is extremely flexible & at times can get a bit complex to setup & understand. Our Admin Health check view helps you make sure that all your basic settings are ok & help set things up faster. J!MailAlerts features a full Subscriber management console for site admins to manually subscribe & unsubscribe users easily. This allows for full control on which alerts to subscribe to etc.